Birch Family Services is the leading education, habilitation, and residence services provider to people with autism and other developmental disabilities in Greater New York City. 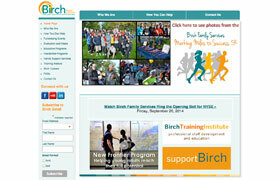 Birch engaged ActiveCanvas to reorganize and maintain their outdated website. We are gradually redesigning the structure and content while keeping costs low by making smarter, more targeted decisions one section at a time. The Birch Training Institute uses the website to create accounts for the hundreds of groups and individuals seeking to expand their expertise and capacity to provide services to children with autism spectrum disorders and related disabilities. These accounts register both Birch employees and others for the myriad of classes BTI offers on a regular basis and keeps track of their progress.